This is a bargellow version of a quilt pattern surrounded by simple stitches. It's really an 8-way, not 4-way pattern. the central star, composed of nine-patch blocks is done in three colorways to make it a variation of another classic pattern, baby blocks. Baby Blocks, like any "3D" pattern, uses three tones of one color--a light, a medium, and a dark-- to make the stitching appear three dimensional. As a result, the star seems to be made of blocks, but they don't conform to normal space, creating a weird effect. I screwed up using the three shades around the outside. It's ok, but the outside detracts rather than enhances the central motif. This four-way bargello is done with variaged thread from the Caron Collection. Each of the three "braid" frames is done with a different set of three threads dyed in similar colors. The diamonds in between show off thread blending the main colors. The center block is worked in baby blocks and edged with diamonds. This is a pattern called "Spanish Tiles," a variation on various pinwheel/flower/diamond multiple four-way patterns. Each "tile" (or pinwheel or diamond, whatever) is the center of a four-way pattern that blurs into the next four-way section of the canvas. This is a hard one and not a good idea for a first pattern to try. I used variagated pearl cotton, which unfortunately this scan doesn't reveal too well. The pinks blur into maroons and greens--all rose bush shades. 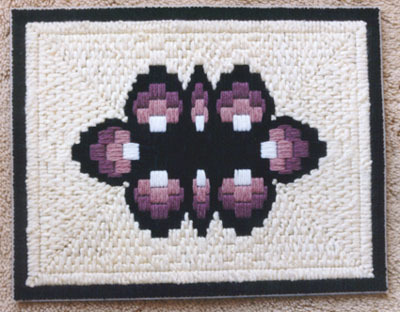 Below are some other color ways of this pattern; the pattern is available at this web site: Needlepoint Kits. (The five images below are copyrighted by Needlepoint Kits). I particularly like this pattern because you can manipulate the end treatments and filling in the edges were the patterns meet in different ways. 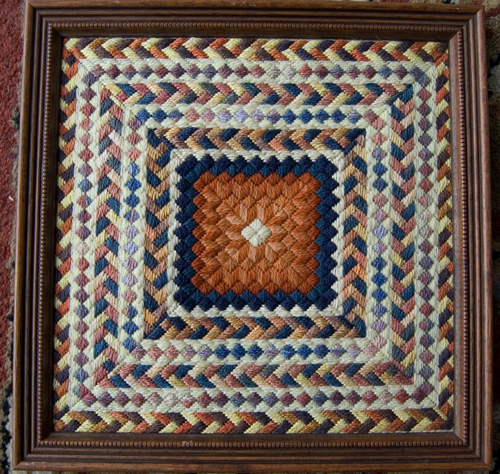 Here I use Gobelin stitch on the frame of the bargello to add interest. I've done another in this size in yellow and two rectangular four-way versions one in green and white and one in yellows. This yellow piece is another four-way rectangular variation of Dalia. The edges are worked differently from the green version, in a sort of pyramid effect rather than a medellion effect. This simple green and white pattern is a rectangular variation of Dalia. This is a very simple piece done on seven-thread per inch plastic canvas. It is done with a new weird yarn by Lion that has a shiney thread rapped around a rough wool main thread. It gives a very nubby look. The black is chenille yarn which creates a striking contrast in textures. The image is a very simple four-way shape made into a crude rectangle to fit the canvas. 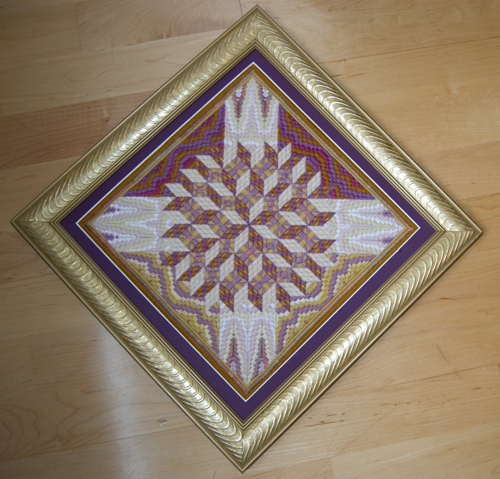 This is my first piece done in 14 threads per inch using all persian wool. It's a rich four-way diamond pattern. This took me from July to January to finish because of the number of stitches and my busy work schedule.